"The birth of a baby is a great moment for any family and Australia shares this young family's joy," Mr Abbott said in a statement on Saturday night. "We wish the young Princess a long and happy life. I am sure that the Princess and her older brother, Prince George, will in time develop a deep familiarity and love of Australia, feelings the rest of their family already share." The Queen of Australia's Governor-General, Sir Peter Cosgrove and Lady Cosgrove said they were "thrilled" by the news: "We hope Their Royal Highnesses enjoy this special time as well as the life of fond memories they will build together as a family. We look forward to seeing the whole Cambridge family in Australia sometime in the future." On behalf of the government and the people of Australia a gift is dispatched to the Duke and Duchess of Cambridge to mark the birth of the new princess. A cot blanket made from Tasmanian merino wool has been sourced from Launceston's renowned Waverly Woollen mills. The blanket will be embroidered with the Australian floral emblem , the wattle, by members of the ACT Embroiderer' Guild. In honour of the birth of the Princess, the Government will also contribute $10,000 to the Healesville Sanctuary, part of Zoos Victoria, to support the important work it is doing for the Mountain Pygmy-possum (Burramys parvus). Healesville Sanctuary has established specially designed cool-room facilities to support the research and the captivity breeding of the species. The Mountain Pygmy-possum is Australia's only hibernating marsupial. There are less than 2,000 left in the wild. Less than 2,000 Mountain Pygmy-possums live in the wild. 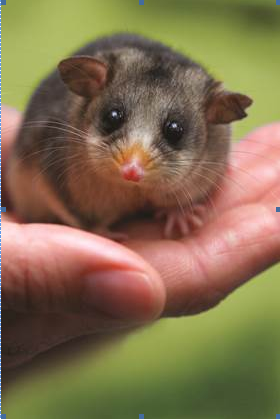 The new princess will be invited to see the Mountain Pygmy-possum herself. Tony Abbott: "I hope one day the princess can visit Australia and hold a Mountain Pygmy-possum herself"
Australia's government under former Prime Minister Kevin Rudd gave Taronga Zoo's bilby preservation programme a $10,000 donation as a national gift to commemorate Prince George's birth on 22nd July 2013. On last year’s trip to Australia Prince George met a marsupial named after him. At Taronga Zoo in Sydney, he was introduced to the bilby called George. 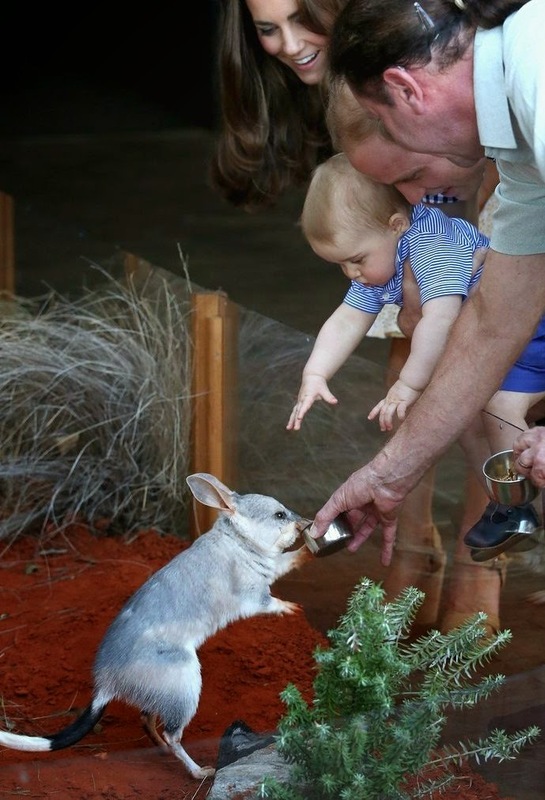 The bilby was in the newly-named Prince George Bilby Exhibit, officially opened by the Duke and Duchess on 20th April 2014, with a low glass screen that Prince George could peer over as he stood up, supported by his mother. The room was darkened because the animals are nocturnal. Prince George met George the bilby in April 2014. George, a three-and-a-half-year-old bilby, was named George two months ago to celebrate the Prince's birth. Greater bilbies, nocturnal marsupials who hide in burrows during the day, are rabbit-like creatures with large ears that pick up sounds of insects and have long noses to sniffs out seeds and bulbs. They were once common in Australia's grassy woodlands but have been driven to the verge of extinction by predators such as foxes and cats and competition from rabbits, all introduced to the country by European settlers. With only 10,000 left in the wild in northern Queensland and Western Australia, a conservation campaign begun in the late 1960s has gathered pace in the last decade with chocolate Easter bilbies replacing chocolate bunnies in many Australian children's homes.